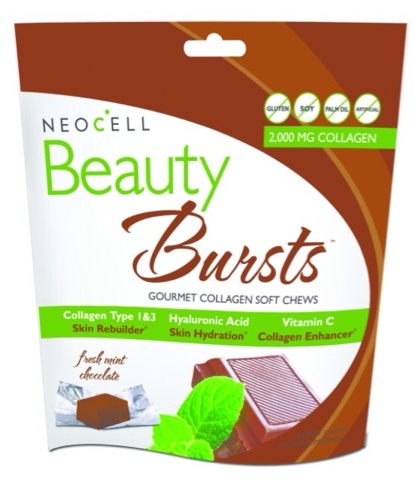 NeoCell Beauty Burts are an awesome blend of collagen types 1 & 3, hyaluronic acid and Vitamin C. Together this end helps skin and nails. Skin is softer, more hydrated (hyaluronic acid holds 1000x more than its own weight in water), and it looks better. Lines are softer and less visible. Wrinkles are less noticeable. Skin looks better in general. This product also helps nails grow faster, stronger, and better. Nails are less brittle, less likely to break and they are in general all around better. 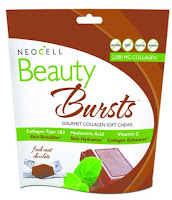 I have tried a good number of the NeoCell line and I love all of their products. They specialize in collagen but also have a lot of biotin and other products. These chocolate mint chews are available a good number of places. These chews were voted 2013 "Best of Natural Beauty" from Better Nutrition Magazine and "Best Beauty Supplement" from Delicious Living Magazine. Go to www.neocell.com for more information and where to buy these products.